Nearby Festival Place – a vibrant multi-use centre for the arts – hosts over 100 professional performances and summer’s Qualico Patio Series each year. Millennium Place is a multi-purpose recreation facility located off Broadmoor Boulevard and offers activities for people of all ages. 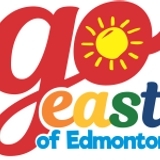 Take in the annual Great Canadian Trade Fair here on April 13-15. In July, start with the festivities of Sherwood Park's Canada Day Festival and Parade. Take in Savour Strathcona County on July 8 – the annual event is a celebration of gourmet cuisine, art and culture. The event features Strathcona County independent restaurants and food trucks who are encouraged to use local ingredients. Meet local artists/artisans who will have their creations on display and for sale. Enjoy entertainment and activities throughout the evening. Combine shopping, entertainment and a stay at The Park Centre Hotel, a boutique 38-room hotel with walking access to Festival Place and the Sherwood Park Mall. Enjoy the Namaste Wellness and Day Spa, grab a fresh choice at the Glow Juicery and Café, or enjoy fine dining at the Sawmill Prime Rib and Steak House – all located at The Park Centre Hotel. See page 34 of our Stay (Accommodations Guide) for a complete listing of Sherwood Park Hotels. 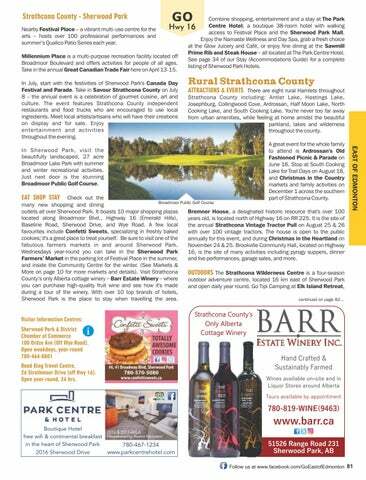 Rural Strathcona County ATTRACTIONS & EVENTS There are eight rural Hamlets throughout Strathcona County including: Antler Lake, Hastings Lake, Josephburg, Collingwood Cove, Ardrossan, Half Moon Lake, North Cooking Lake, and South Cooking Lake. You're never too far away from urban amenities, while feeling at home amidst the beautiful parkland, lakes and wilderness throughout the county. A great event for the whole family to attend is Ardrossan's Old Fashioned Picnic & Parade on June 16. Stop at South Cooking Lake for Trail Days on August 18, and Christmas in the Country markets and family activities on December 1 across the southern part of Strathcona County. In Sherwood Park, visit the beautifully landscaped, 27 acre Broadmoor Lake Park with summer and winter recreational activities. Just next door is the stunning Broadmoor Public Golf Course.